The Slaughter-House Cases have a bad reputation for good reason. Justice Miller’s narrow reading of the Privileges or Immunities Clause was used to prevent the federal government from adequately protecting African-Americans after the Civil War. Further, his opinion for the Court significantly delayed the application of the Bill of Rights to the states. But no one knows whether the world would be better with a different decision, because counter-factuals are never certain. The case did not involve either racial discrimination or incorporation, and total condemnation of the opinion for weakening civil rights misses its context and misreads its design. This Article sets forth the Slaughter-House Cases support for civil rights. Justice Miller used federalism in order to protect Reconstruction legislatures where significant numbers of African-Americans participated fully for the first time. His recital of the history and purpose of the Civil War Amendments centered on the Amendments’ design to protect African-Americans and suggested sweeping federal power to accomplish that end. Gutting the Privileges and Immunities Clause compelled the Court to read the Equal Protection Clause broadly and was indirectly responsible for the reapportionment decisions of the Warren Court. 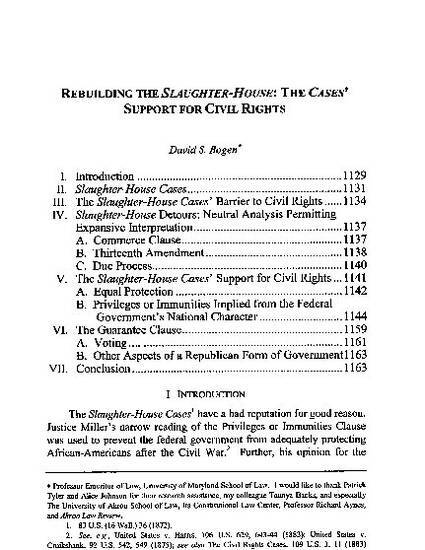 The Slaughter-House Court’s structural analysis and its view of federal protective power provide a basis for congressional power to protect citizens from any interference with their participation in the federal political process (voting, discussion of and access to the federal government). Justice Miller’s analysis also supports federal power to protect citizens from race based obstruction to their participation in state elections. The difficulties of proving racial motivation do not justify blaming Miller’s opinion for the end of Reconstruction and the rise of segregation. At the turn of the century, the Supreme Court retreated from the federal power to deal with race proclaimed by Slaughter-House and its progeny, but the Guest case revived the analysis in 1966. More recently, United States v. Morris cast doubt on Guest’s statements of federal power to reach private action. This Article argues the Court should resolve that doubt in favor of the constitutionality of laws to prevent discriminatory interference with access to state elections or other facilities. As I will discuss further, Article Four’s guarantee of a republican form of government reinforces that result and provides an alternative path for returning to the vision of the Slaughter-House Cases. 42 Akron Law Review 1129 (2009).